At very low tides beachcombers sometime run across Flustrellidra corniculata, the branched-spine or spiny leather bryozoan. They occur in the low intertidal and below, down to about 75 meters, which is 250 feet deep. In the intertidal zone they are members of the Laminaria community I described in Finding Yourself in the Infralittoral Fringe. As Bryozoans go, Flustrellidra corniculata is on the fleshy and soft-bodied side; but decidedly spiny. Clumps grow to 4 or 5 inches tall, so the ones in the photo above are just about at the max. 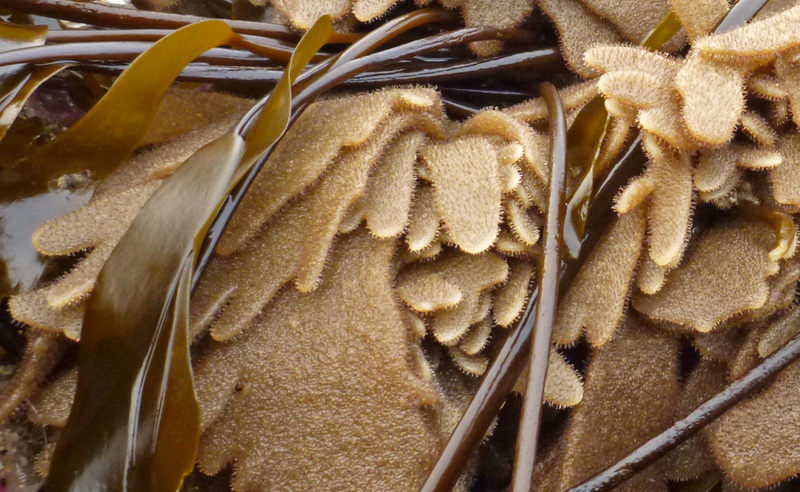 In the low intertidal and shallow subtidal zones they love to attach to the base of Laminaria. The specimen above is affiliated with dense-clumped kelp, Laminaria sinclairii. If you want to find out more about bryozoans, check out this Introduction to the Bryozoa.